The art of weaving carpets still survives in Iran, but the tradition is struggling. 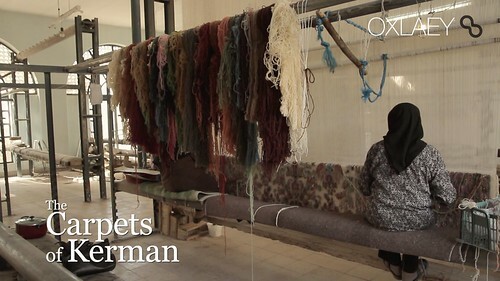 Four interviews with artisans from Kerman ( کرمان) illuminate the beauty and struggle, which traditional carpet weaving faces in today’s Iran. Retired Abol Hadi still weaves carpets out of passion. A group of women on the edge of the desert weave to survive, earning less than 1 US dollar per day (managed by Mohammad Afzalinejad). In a posh retail store, Mr. Mohammad Heravi sells finished Iranian carpets, but only a few blocks away, antique weaving equipment sits collecting dust at the Kerman Carpet Company where Mehid Mahvabadi is an accountant. Heravi: We act as the middle man between weavers and buyers. Nothing here is machine made. There’s only handmade carpets here. Our focus is on hand woven carpets from Kerman as well as from the surrounding area. [A carpet’s price] depends on the quality of the raw materials, the type of weave, the design, and the knots. The more delicate the knots, the better the quality. Visit a carpet workshop and see how they’re woven. Look at the weave and you’ll appreciate hand-made carpets by paying attention to the patterns. They’re made up of knots. Tied around strings. On the back [of the carpet] you see how they’re tied. Each knot is a little different. They were all tied one by one. Hadi: This carpet will be 63 cm squared when it is finished. It will have approximately 13.5 million knots in it. It’s a tapestry. It’s not for walking around on. The [tapestry] will have scenes with fruits, tomatoes, peppers and the tree of life. [It’s] a specific design, unique to Kerman and my friends, who came together to design it. I was 9 years old when I designed my first carpet. I’m now 72. I learned to weave carpets in Rafsajhan, some 40 kilometers away. There is a hillside village called – locals call it Derdu. I lived there until I was 26 years old. Later I came here to Kerman and worked as a technical inspector at the Kerman Carpet Company. I worked 10 years for the company and then resigned. After that I moved to the private sector. Mahyabadi: Out carpets are for export, so our head office is in Tehran. [The carpets] are sent to Tehran, evaluated there, and exported. A few are sold domestically. Regarding the company’s history, 93 years ago it was owned by the East India Company. An especially huge thank you to these lovely people who helped translate the interviews from Farsi into English: Faly Golshan, Amjad Nezami, Azadeh Nigjeh, Farid Rostami, and Sean PI Stewart. Without them giving freely of their time and talents, this video wouldn’t have been possible. A special thanks to Ebrahim Alavi and Amjad Nezami at the Kerman Chamber of Commerce who facilitated these interviews in November 2014.